I am posting this to prove to myself, that the possibility of spring is just around the corner. 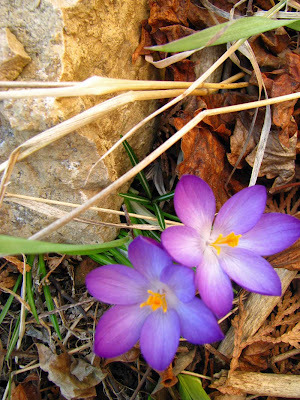 I found these crocus on the side of our studio, basking in the sun, unabashedly brave and tender looking. And since I am in denial of the fact that it is snowing like crazy today, I will visit this blog post often, to remind me of what will soon be. I heard some peepers tonight! And some wild geese flew by with the moon on their wings We’re almost there! Spring’s colors, to say nothing of the beauty of the flowers, are certainly uplifting. Thanks for the beautiful photo.